I sucked less this time. yay! Last night was another three-games evening. Acquire, Seven Samurai, and Castle. I believe we had one of those common-denominator moment when we try to find a game that all of us, with guest coworker-D, can agree on. So we started with Acquire. I modified my play to hold less companies, while focused in one company where I had the tiles to maneuver into a merger. It worked about 30% well, many planned moves did not pan out. I did better, but I am still feeling behind on this game. After Acquire, someone wanted to try Seven Card Samurai. I picked out Seven Samurai a couple of months ago when you and I went to the game store. Our criteria was something light, quick, and a filler when we don't want to play long cerebral games. Since I do not play cards, all the comparison was lost on me. N really hated this game. I try to give games at least two chances before I hold a negative opinion. And even then, I will try again, seriously! 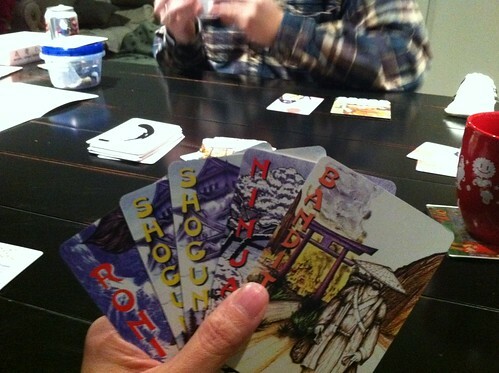 (Hi Mille Bornes) The rules are pretty simple - defend your rice and build an army of Seven Samarai. The down side - the card size was awkward, heavy, and the art is kitschy. 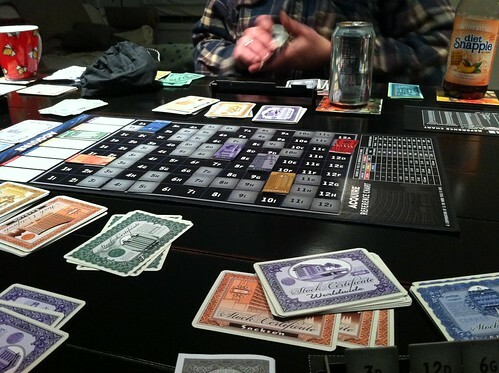 I will play this again, without N.
We tried to rescue the evening, and end on a fun note with Castle. The game went faster with five players. 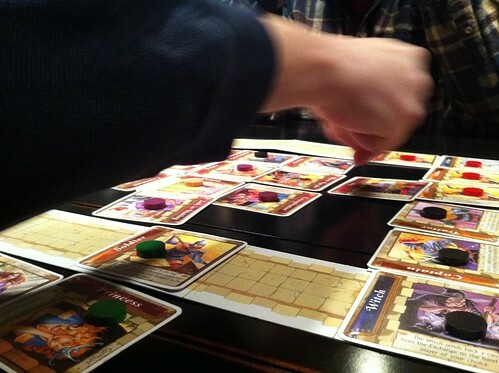 I like Castle a lot, we have not played it in a while. 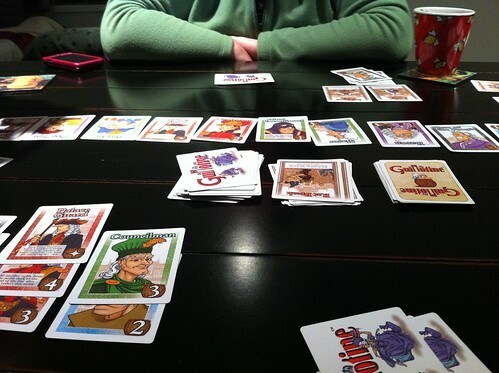 I think we put it asided when it became contentious, plus we were stuck in the Bohnanza rut. We discovered a rule we have missed regarding the soldiers and siege engines. D was confused by this game since it requires a few times to see all the cards & their actions. 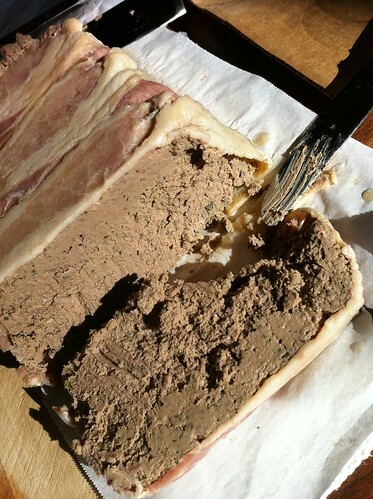 I've had the urge to make pate for a long while now, but in keeping with the spirit of lighter fare, I refrained. I rationalized this time by the prospect of having another guest (victim!) with a hearty appetite, D - coworker friend. I read a few recipes and mostly they prescribe various combination of livers, meats, and seasonings. One of the recipes in Charcuterie (Michael Ruhlman, Brian Polcyn and Thomas Keller) start by browning the livers. I couldn't resist another caramelized brown food opportunity! I sliced and browned 1 lb each of pork liver, beef liver, and chicken liver, pureed with lots of garlic, onion, thyme, tarragon, and truffle salt. Poured in a loaf pan lined with bacon. Baked in a water bath until temperature reached 160°F. I put weight on it while it cool. It rested in the fridge for a few days. D seemed to like it. I served it with a few cheeses and other accouterments. I had plans to add a soup and [substantial] salad and call it a meal. But after I got the most puzzled "Where is the meat?" 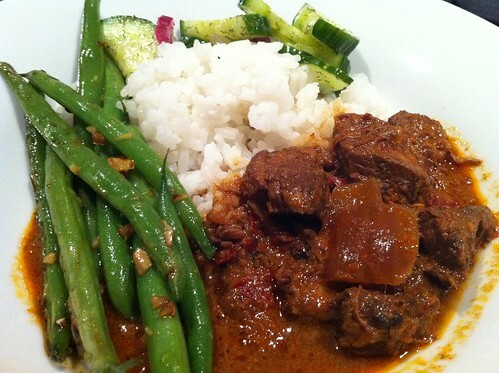 look from both G and D, I pulled out the back up mismatch dish Malaysian Beef Curry from the last issue of Bon Appetit. Instead of a slow cooker, I cooked the whole pot in a 250°F oven overnight. The curry was very easy, but it lacked 'something." Any thoughts? 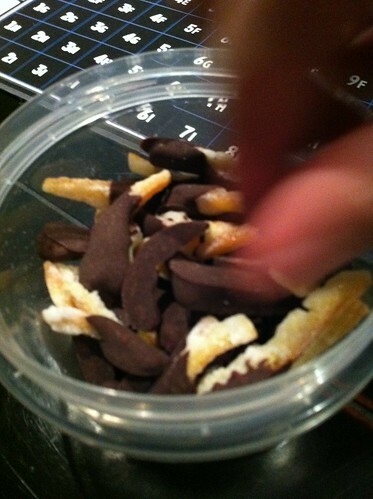 After the games of Acquire, I pull out chocolate dipped candied orange from your cannolis. Mmm. A little something. Or as someone put it, 'crap'. Do you have more candied orange? If so, I will happily chocolate dip them! 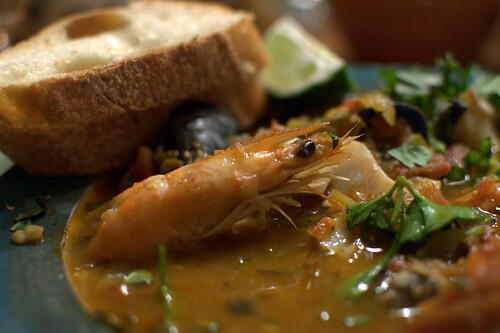 Unlike those of us who have spent lots of time in the Bay Area, I didn't have cioppino until 2003 when N made a huge stock pot full of it for a group of us. This past weekend I had cioppino for only the second time when N made it for game night. Afterwards we all wondered why we don't have cioppino more often! I think it has been decided that it will now be an annual meal. 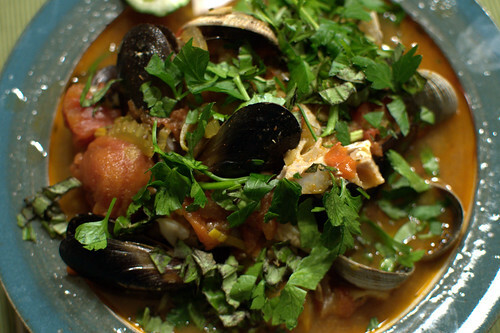 Cioppino is one of N's family recipes, from his mother's side. He adds his own little twist to it, but he stays true to the family recipe. First N made fish stock. He simmered coarsely chopped carrots, celery, onion, 3 lb fish bones & parts (lingcod pieces, pacific black bass collar), garlic, black peppercorns, salt (1/2C), bunch of parsley, 4 bay leaves and approximately 2 gallons of water until it reduced in volume about 30% and was very aromatic. For the cioppino, he made a combination trinity-mirepoix (ha!) with diced bell peppers, onion, celery and carrot simmered in some butter and olive oil. Once the onions became transparent, he added a few cloves of smashed garlic, oregano, a bunch of fresh thyme, and a bay leaf. Shortly thereafter he added canned whole tomatoes, a bottle of dry white wine, a 12oz can of tomato juice, a bunch of fresh herbs: thyme, parsley, oregano, cayenne chili peppers and a tablespoon of cayenne powder. Finally he added about 8 cups of the fish stock and salt and pepper to taste. It simmered for about 3 hours until there was a sheen released to the top of the pot. At this point N made me taste-test the soup and I worried that it was too spicy and not fishy enough, but N reminded me that all of the seafood had yet to be added. to your death, so sorry! 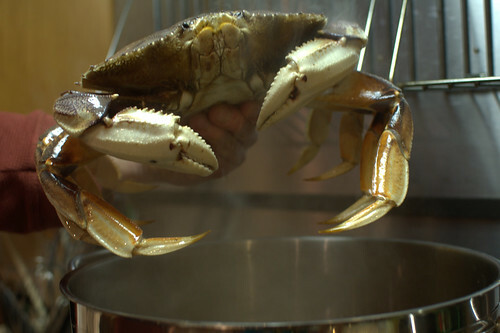 Two dungeness crabs (2.5-3lb apiece) were added and steamed for 15 minutes, then removed from the pot. 1 pound each of mussels and littleneck clams were added and cooked for 5 minutes. Finally a pound each of cod fillet cut into strips and 16-count prawns were added and simmered for 5 minutes (until cooked). N filled our bowls with a massive quantity of seafood and liquid, topping them with fresh parsley, basil and a lime quarter (sad limes!). The cioppino was delicious and felt extravagant without feeling (too) heavy, maybe because I think it took me an hour to eat half of a dungeness crab! It wasn't overly spicy once all of the seafood was added, thankfully. Before the cioppino, I wanted to make a light appetizer and decided on edamame. While N and I were in Hawai'i, we went to a bar one evening and just wanted a little snack with our drinks. We ordered their Truffle Garlic and Togarashi Peppered Edamame and it was delicious. I tried to replicate it at home but unfortunately (for us) it turned out a little too spicy. I steamed a bag of frozen edamame and held it in reserve while I mixed soy sauce, brown sugar, togarashi spice blend and lemon juice together. Then I quickly sautéed a few cloves of garlic in a touch of butter (instead of making beurre blanc), adding ginger matchsticks once the garlic started to sizzle. 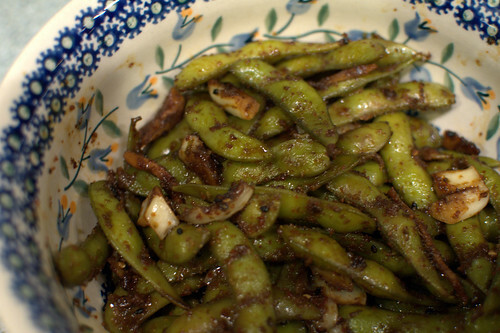 Then I added the soy mixture to the pan and once it started bubbling, I added the edamame and stir-fried it in the sauce. After removing it from the pan, I drizzled it with truffle oil and sprinkled it with alaea salt we picked up in Hawai'i. I think the schichimi togarashi blend I picked up at Uwajimaya was spicier than the one the restaurant used, so I'll try it with less togarashi next time. 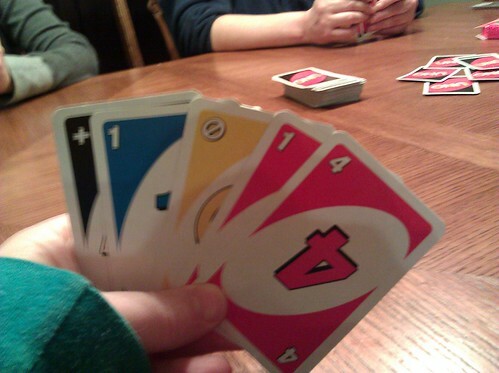 By the time we finished eating, it was too late to play a complicated game and the boys pulled out Uno again... Oy. I might have to hide the Uno decks next weekend! 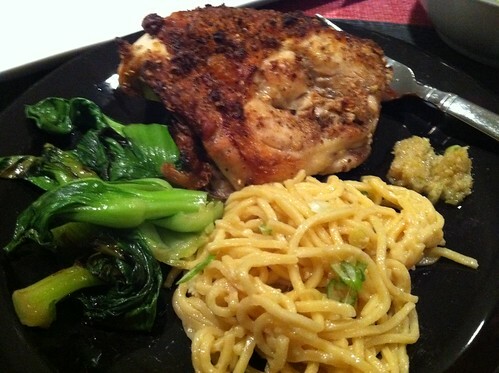 This week, we served Szechuan Pepper Roasted chicken, garlic noodles, and bok choy. (and marinated mushroom snack). I was very nervous about serving chicken, due to previous undercooked chicken incidences. This was an opportunity to recover, slowly, the ability to cook and serve chicken to you and N! A few weeks ago, coworker and I went to Penzeys near Pike Place Market. I have browsed Penzeys' catalog online, but had never been to their stores. I was looking for cardamon, but left with Szechuan peppercorns also. I occasionally ran into forums, in the last few years, that discussed the import ban on these peppers ( wikipedia entry). So I wanted to try using the real thing. I used a very simple roasted chicken recipe from Steamy Kitchen, and added extra insurance of brine overnight with chicken stock, ginger and star anise. I started at convection roast - 425°F, and set meat thermometer to 158°F, in the half breast, to ensure there will be no trace of pink. The chicken browned really fast so I ended up lower the heat to 400° half way through. It took about 45 minutes and the skin crisped to a nice dark shade of golden. Oh how I like crispy food. I also made my favorite ginger garlic dipping sauce as flavor insurance. The garlic noodle was my second (or was that third?) attempt at recreating the garlic noodles from Thanh Long, An Family Vietnamese restaurant, recipe from Rasa Malaysia. I used fresh yaki soba noodles and slightly more garlic than the recipe. I totally failed on this one - mushy and greasy. The vegetable was a no frill default stir fry bok choy. Mmm. Overall, I was satisfied, a step towards a chicken recovery. Although G is still not allow to cook chicken. Was everyone a bit tired last night? no one wanted to venture to a new game after dinner. 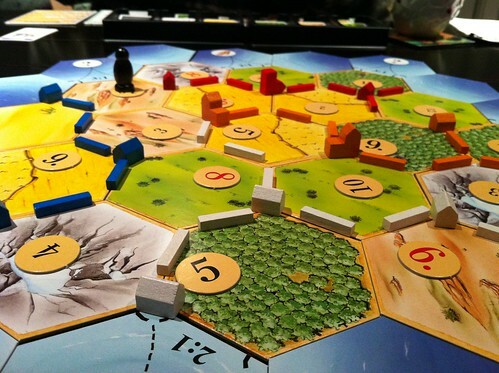 Instead, we visited some old friends - Settlers of Catan, Guillotine, and MamaMia! Those are my perennial favorites, even if I lose at MamaMia and Guillotine all the time. Happy belated birthday! With all of my travel last month we delayed your birthday meal until the tail end of February-- an extended celebration! While I worked on finishing dinner, N picked up some supplies and made fruity mai tais in an effort to bring Hawai'i to Seattle. I pulled out some pork tenderloins and made spice-rubbed pork tenderloin. I adjusted the spice mix a bit -- I omitted the star anise and replaced it with 2 additional tablespoons of coriander seed and 1 tablespoon of fennel. I will try it with star anise next time! I thought some greens would go well with the pork tenderloin, so I made quick spinach and kale with onions and hazelnuts sauté, inspired by this recipe. I wasn't sure if the boys would eat straight kale, so I opted to cut it with the spinach. Both the kale and spinach were from my farm share. 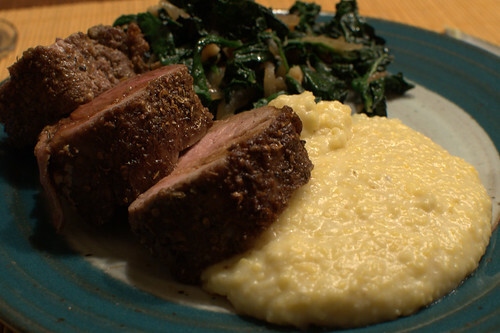 Finally, creamy polenta finished the dinner. I've had some trouble in the past where the polenta solidified a little more than I wanted to, so I tried to prevent that from happening by adding a tablespoon of marscapone to the pot. It wasn't much, but it pushed it over into the "too rich" department for you. I also used 1 C milk and 3 C chicken stock to 1 C coarse cornmeal. That said, it did keep the polenta from solidifying too much and the leftovers were great with spicy blackened shrimp! Your birthday dessert request varied between a few things but finally became "either tiramisu or cannoli." 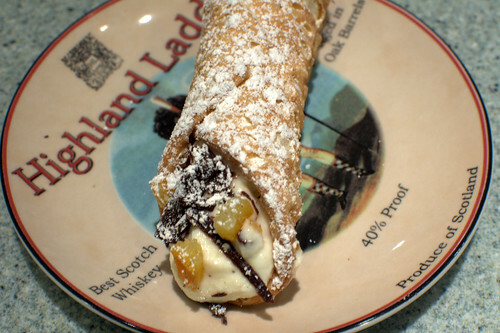 N suggested a tiramisu cannolo -- fill a cannolo shell with a lady finger soaked in booze and then pipe marscapone around it -- I vetoed that idea and made straight up cannoli. My mom gave me some tips on the cannoli filling. 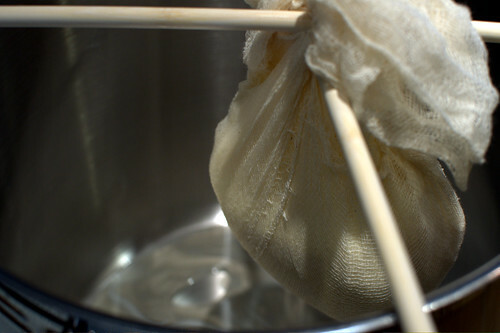 I drained the ricotta overnight with the help of N and some very long chopsticks. About a half cup of fluid came out of the ricotta! I blended the ricotta with confectioners sugar and a touch of vanilla extract, then split it in half (here's a recipe). To one half I added a bit of cointreau, chopped dark chocolate and minced candied orange peel (flickr set). I was a little worried about adding too much of any of those items because I've had some cannoli filling that was overpowered by too much candied orange peel. The other half of the filling I left plain and simply added crushed pistachios to the ends after filling the mini cannoli shells. I was fairly happy with how well the Sicilian style filling came out, but I think it could have stood up to a bit more orange flavor. I ordered the cannoli shells from cannoli by mail and they arrived mostly intact (one large and one small shell broke) and tasted alright. Not as good as homemade, of course! 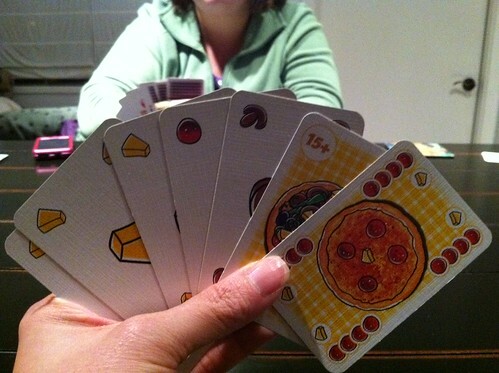 After dinner and dessert, we played a million games of Uno that G eventually won. Of the 17 rounds we played, you won a single round. Not really fair considering this was your birthday celebration! Hopefully the cannoli helped alleviate the Uno loss pain.